I believe you should use the tools that suit you. As a software developer, my computer is my toolbox. And I wanted to share what it is. While writing this post I realized how much I want not only to list my setup but also explain what are the reasons for each element of it. This makes it not suitable for one post. That's why it's going to be a few separate blog posts on each of the parts. My current computer is a one supplied by my company — Wikia. It's Dell Latitude E6430s. 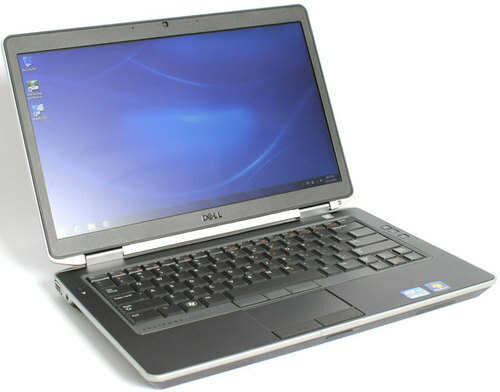 Previously I also used an older version of Dell Latitude, both are very similar-looking and built around the same platform. The computer is based on Intel hardware: Intel CPU, Intel Ethernet and Wi-Fi cards, Intel graphics. The hardware is very nicely supported by Linux, which will be covered in the next post. I'm a big fan of docking stations: you just put your laptop on it and you don't need to play with any cables whatsoever. The laptop gets power from it and you can connect a few devices through it all by placing the laptop in the correct spot. I used to have two external screens, but now I only have one — a bigger one, though. The main difference between my old and new laptop from my standpoint was the number of simultaneously supported screens. Previously the graphic adapter could only support 2, the new model supports 3. With the old model, it was very tricky to script the computer in a way that would switch from displaying the contents just on the laptop to displaying it on two external screens. You needed to do that in stages: first, activate one external screen, then disable the laptop screen, and finally activate the other screen. I did finally craft the script that worked, that it required some time. With the new model, the regular tools for screen management (based on XRandr) works flawlessly whether you want to use internal, internal + 1 external, 2 external or internal + 2 external screens and whatever the transitions you want, it'll just work. When I joined Wikia, my first project was rewriting the ad engine. That required a lot of coding and my hands started to be in pain. 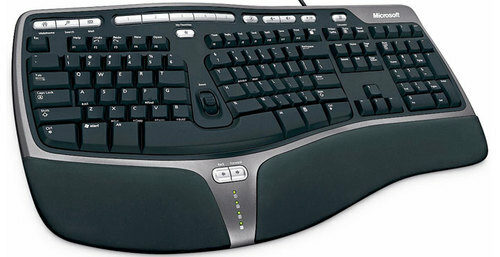 I asked for an ergonomic keyboard and got one. The keyboard I used was a Microsoft Natural 4000. I'm not an expert on keyboards, but I must say my pain was gone and I never wanted to type on a non-ergonomic keyboard again. When I moved to the States, my keyboard was left in Poland, so I asked for another ergonomic keyboard and got a Microsoft keyboard again. This time, it was a different model: Microsoft L5V-00001. The keyboard took some time to get used to, but as before my hands don't hurt. 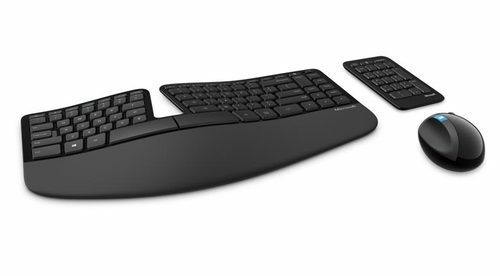 I want to say one thing here: I don't think ergonomic keyboard (or mouse for that matter) makes you type faster — your body can adjust to using almost any sensible tool at comparable speeds — but it does help you type without pain. As I spend a good part of the day typing, this is important. As for the mouse, almost anything goes, I used wired, Bluetooth and proprietary-wireless-USB mouses. Also the laptop touchpads. Dells are equipped with track point devices. I don't like using them. I like the fact you get a dedicated middle button with it, I use it way more often that most of the people. One thing that I absolutely need my mouse-like device to give me is a sane scroll and the middle button I mentioned before. My Bluetooth mouse has the scroll broken — when scrolling down, it sometimes scrolls up — and this is very very annoying for me. Summing up: I don't use the mouse that often, mostly to scroll content, so give me anything that allows me to scroll, and I'm happy. 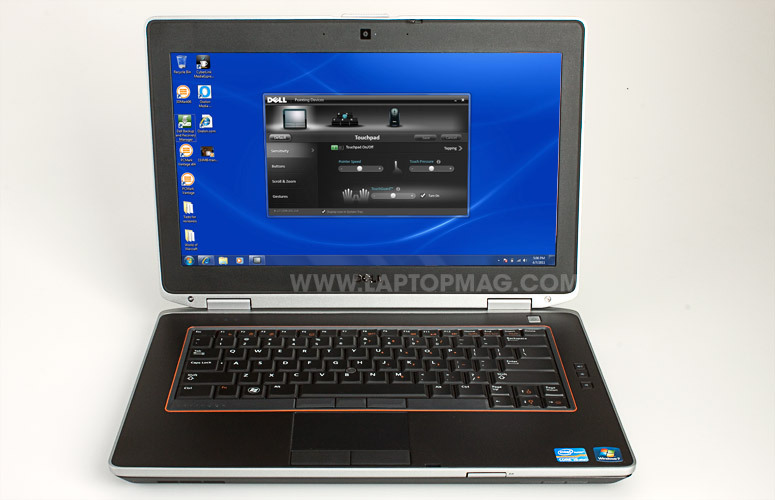 The laptop has a removable big capacity battery, SD card reader, USB3, and eSATA. It features an extension bay which by default is occupied by a DVD-writer. I have a 500GB placed in there with the original Windows installation moved to it, so I can both boot to it and start it in VirtualBox. The very annoying part of the laptop is the HDMI output, which is realized through a mini-HDMI port. The port is not very solid and after using it just a few times it stopped working (mechanically, it was later replaced by Dell support). You also need the adapter which you normally don't carry on you. As the desks in the office don't offer height alignment I ordered a monitor stand and I'm having my keyboard sit on top of it. This makes up for the fact my desk is too low for me. I keep my mouse on it too. There's no place for my num pad, but that's OK.
With my keyboard already risen, you can expect my screen needs to be placed high as well. Even with quite wide height-alignment range of the screen, it's not enough, I placed the screen on a bunch of Amazon boxes. What works one day, doesn't work on the other. Every few days I adjust the screen and the seat to be higher or lower just a tad, just to change the position a little bit and to not cause any Repetitive Strain Injuries (well, not really, but I guess you know what I mean). Whenever I'm not at work and I use my laptop, I use it completely bare: no external screen, no ergonomic keyboard, no optimized seating position, usually no AC cord. The battery, when fully charged, allows for anywhere between 3 and 6 hours of work/play and that's more than enough I need to use my computer outside the office. The next posts will be dedicated to the operating system.